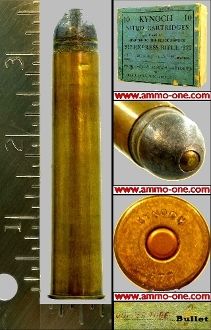 One two piece box (as pictured) with one cartridge only: .577 Black Powder Express, factory produced by Kynoch or England, before the 1930s using a (then) new 3" case with “Kynoch .557" Head-Stamp and loaded with a 570 grain “COPPER TUBE” lead projectile. A very hard find today, from the box in the picture. If interested in cartridge only see below in related items.